Despite wishing to avoid the whole Beer Summit thing, I can't help but point to this wonderful article by Maureen Ogle in Sunday's Washington Post (the internets are so fast they now carry future publications). It's the first really novel take on the whole thing. In it, she traces the history of beer and race in America. Despite the fact that blacks drink about as much beer as whites, to this day the only black-owned brewery in U.S. history was a short-lived enterprise in Wisconsin, launched in 1971 by a former Blatz executive. 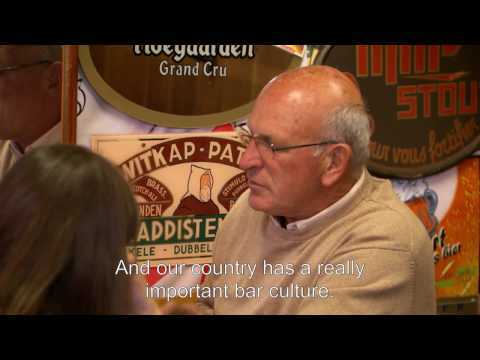 Otherwise, American brewing, the creation of German immigrants in the 19th century, was and largely remains a white man's world. I feel compelled to at least acknowledge the hugely overblown "Beer Summit" yesterday. And now I have. Concordia Cup, Today through August 2 at the Concordia Ale House. Twelve Double IPAs vie to be Oregon's entry in Beer Brawl III. Taster trays are $12. Full details here. 15th Annunal Rogue Bones and Brew, Saturday and Sunday, 14th and Flanders. Live music, barbeque, 20+ craft breweries, all to benefit the Oregon Zoo. Full details here. Bailey's 2nd Anniversary Celebration, Saturday noon - 10pm. It's a mini-fest with an amazing line-up of beer (Derek has the list here). Ten bucks gets you a glass and three pours. Full details here. Double Mountain Cookout and Street Party, Saturday noon - 10pm in Hood River. Live music, barbeque, and a full slate of DM beers, including two I am keen to try, Pilsner and Little Red Pils. Full details here. Surely you can find something amid these lush offerings with which to amuse yourself. 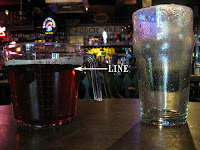 Barbara Harnish of the Main Tap Tavern in El Cajon, California sent in a photo of the honest pints they're pouring there. El Cajon is east of San Diego a region quietly vying for the title "Beervana South". The Main Tap is just a little over a year old and has forged relationships with Coronado Brewing, Lightning Brewery, Firestone Walker and Ballast Point. They offer two dozen taps of great micro (including a current pour of Maine's Shipyard) and also have quite a bottle list. Their menu looks pretty tasty, too. So if you're in the area, stop by and have a pint. Heineken sales sank 18% from the previous year in grocery, convenience and drug stores during the two-week period ended July 5, followed by Budweiser at 14%. Corona Extra sales dropped 11%, while Miller Lite declined 9% and Bud Light fell 7%. Coors Light sales held up better, falling less than 1% from a year ago. Meanwhile, sales of “subpremium” beers including Busch, Natural Light and Keystone posted “substantial gains”, according to Ad Age, which didn’t provide the specifics. But while the economy is clearly dragging on the biggest beer brands, the severity of the declines also raises questions about the effectiveness of some of the category's biggest ad budgets. The decline at Bud Light comes as the brand is nine months into its "Drinkability" effort, designed to give the beer a more product-attribute-fueled push than its former frat-humor efforts did. Miller Lite has tried to pound its "Great Taste" to sales gains in the same manner its new stable mate Coors Light succeeded with a single-minded focus on "Rocky Mountain cold refreshment." But that effort, too, has yet to gain traction. Gee, I wonder why those ad campaigns have failed to sway drinkers. It couldn't be because, you know, since all tin-can beer tastes the same, customers are buying the cheapest stuff. Nah, couldn't be that. Those of you who follow me on Twitter will know that my recent sojourn to Minnesota was somewhat fraught with failure in an attempt to find indigenous beer. In four days I managed just two: a bottle of Schell's Dark and draft Summit Extra Pale. I found this very strange. The Upper Midwest is beer country and Minnesota has been home to a host of famous brands: Hamm's, Schmidt, Grain Belt, and Schell (still independent after 149 years). 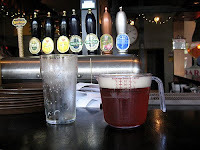 At the various restaurants I visited, the slate of draft beers was almost identical: Corona, a national brand and its "lite" variant, Summit Extra Pale, and one import (variously Guinness, Beck's, and Smithwick's). Yet it is consistent with a surprising finding I stumbled across when I was doing research on highly-concentrated brewing regions: Minnesota, with just 22, a per-capita rate similar to Kansas'. Why would a place with a rich brewing history and towns as funky and beer-ready as the Twin Cities have so little local craft-brewing ferment? One component is definitely local liquor laws. I discovered this as I wandered out the first night on a post-sunset amble. As is my habit, I made for the first grocery store I could find, in this case a Whole Foods near MacAlester College. I spent a good ten minutes trawling the aisles for the beer cooler before it occurred to me to check the iPhone: sure enough, beer and wine can only be purchased in liquor stores. I have no idea how much this dampens sales or blunts local beer culture, but since that's the intention of such a law, and since both beer availability and local beer culture are so constrained, one has to conclude it's working. Another measure: according to the BeerAdvocate listing, Minnesota has only 15 brewpubs; compare that to the 71 in Oregon. 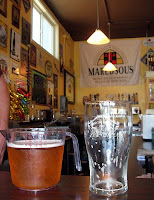 Admittedly, I didn't go to real pubs or even restaurants where one would expect many beers. But all had several taps, yet only one devoted to local craft. In Oregon--or at least in Portland--it would be nearly impossible to find a restaurant with four taps that had only a single local craft beer. I don't doubt that the beer geeks of Minnesota are just as geeky as Beervana's, nor even that there are a lot fewer of them. Yet the experience for the casual visitor is that local beer just isn't getting made or consumed there. I welcome insight and conversation. 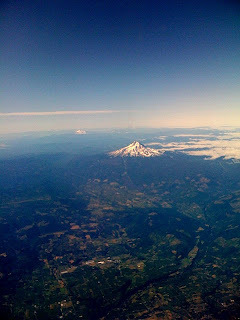 As always, I return to Portland with renewed appreciation. It is surely a force of nature, a sweaty, loud, personal-space-invading juggernaut. The Oregon Brewers Festival, your time is nigh. With so many other fests, a certain number of folks have begun to skip the OBF and leave it to the tourists. Fair enough--the fest is not for everyone. For many of us, though, the last weekend in July arrives like Mardi Gras, not just a party but a sacred rite. In a few hours, the first of the fest-goers will begin to enter Tom McCall Waterfront Park to pay their respects and splash just a bit of holy water down their throats. Christmas has arrived in Beervana. It is not always the case that the Fest is marked by a surfeit of eye-catching beers, but this year is different. For the first time in years--since they did that thing with the Oregon tent--there will be more than 72 breweries in attendance. More pointedly, however, the beer selection seems a cut above. There are quite a few more offbeat beers and far fewer in the pale/IPA spectrum (in past years it's pushed 50% of taps). I usually only see a dozen or so that really intrigue me, but this year there are 18 (!). Actually, there are even more than that, but I tend to skip local breweries, knowing I can track down their beers later on. We don't go to the Fest to enjoy beers we love, we go there to try the new and exciting. 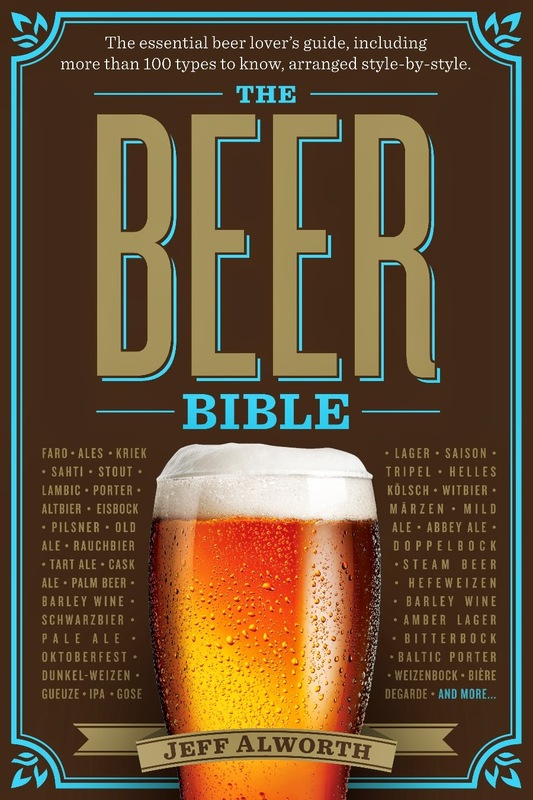 So I will rely on my sometimes spotty wiles, read between the lines of the descriptions, and come up with my best bets for interesting beers to try. Here goes. Okay, I cheated. There are actually twelve beers here. The last entry features a cage match between examples of the year's hottest style, saison. For some reason, nearly every beer I've selected comes from the West Coast. One of those years. Description: A monster in all ways--9% alcohol and intensely hoppy. Called an imperial pale, but traditionalists might call it a stong ale. Why I think it's a winner: The reputation for this beer oscillates between "sublime" and "too much." There will come a time when your palate is shot and you pine for something you can taste: this is your beer. Description: Celebrating thirty years, this is one of the elder breweries of good beer. Flashback is a dark copper beer made with five infusions of Cascade hops (65 IBUs of them, which is a monstrous amount of Cascades), and the word on the street is: mmmmm, tasty! Why I think it's a winner: Brewer David Zuckerman never turns out a bad beer, and I have reason to think he used his decades of experience to make this one special. Stats: 1.066 OG, 6.8% abv, 65 IBUs. Description: A light summer ale made with candi sugar, hibiscus flowers, ginger, and dry-flowered with hibiscus. Small amount of Willamette hops used, too. Why I think it's a winner: Hibiscus flowers are common in tea and are tart--this may be an intriguing quasi-Belgiany beer, and it may be blood red, which would be cool, too. Stats: 4.3%; no other stats available. Description: Dortmund lagers, a variant of the pilsner style, are the perfect summer beers--crisp, refreshing, nicely hopped. Why I think it's a winner: Chuckanut is a new brewery whose principal, Will Kemper, will be familiar to old-timers who remember his first brewery, Thomas Kemper. This is another mostly-lager effort, and maybe now the time is right. Let's hope so; Beervana needs more lagers. Description: Brewed for Sub Pop's 20th Anniversary, this hybrid IPA/pale features the use of an emerging hop, Sorachi Ace. Stats: 1.068 OG, 7.0% abv, 54 IBUs. Description: A burly IPA brewed with five hops: Warrior, Simcoe, Cascade, Centennial and Amarillo. Why I think it's a winner: Firestone Walker is finally starting to make it North of the border, and it's one of the most well-regarded breweries in the country (rightly or wrongly). You gotta have at least one IPA in your must-try list, and since Union Jack won gold in last year's GABF, I figure it's a good bet. Description: Kona uses a lot of local Hawaiian ingredients (passion fruit, macadamia nuts, Kona coffee), and this brown includes toasted coconut. Why I think it's a winner: Kona isn't a gimmick brewery. The passion fruit they use mimics citrusy hops, and the coffee is so fresh you can actually distinguish the Kona flavor, making a great wheat and porter. I expect they will have extracted a nice note from the coconut that will work with the sweeter, nutty notes in this beer. Description: A wheat ale with almost no hops. The flavor comes from the pomegranate, a tart fruit selected to balance the sweetness of malt. Why I think it's a winner: Definitely a wildcard. If the pomegranate is tart enough to balance the beer, it might just be wonderful. I am inspired by the dry final gravity of 1.009. Description: An old ale, a variety of English strong ale noted for being creamy, rich, and alcoholic. Why I think it's a winner: Terminal Gravity is not known for prolific styles, but they are known for great beers. I wouldn't let a TG beer I hadn't try go by--and who knows how often this will make it to Portland. Plus, old ales are cool. Description: Farmhouse ales are so different that you can hardly call them a style. These three are all strong beers, but their parts are quite different. The Collaborator uses the notorious Dupont yeast--but has just 17 BUs. Golden Cap is made with Spelt and peppercorn. Boulevard's is hoppy (like Dupont), and made with wheat and corn flakes. Why I think they're winners: Because saison is my favorite style. Prediction: at least one of these will be a "buzz beer." I cannot predict which, so try them all. Stats: Tank 7: 1.070 OG, 8% abv, 40 IBUs; Christophe: 1.073 OG, 7.7% abv, 17 IBUs; Golden Cap: 1.064 OG, 7% abv, ? IBUs. I haven't tried the new version of Stumptown, but folks are saying it's quite nice. I suspect it will seduce people by its soft palate, and that they will fail to notice its heft 7.5% alcohol whallop. I tried this in a bottle and it was flat, cloying, and gross. But a peach-infused Berliner Weisse seems like an excellent idea. Perhaps it will taste as good as it sounds when delivered from a keg. Sometimes a name draws you in: Flower of the Gods just sounds good, doesn't it? The Cluster, Simcoe, and Tettnanger hops, introduced in six infusions, may be the key. With a name like this, you're swingin' for the fences; lets see if they take it deep. This is actually not a wild card--it's been around town for awhile and I've heard very good buzz. It features the rare and apparently very tasty Citra hops. Try it. Laht Neppur Neddy's Brown comes from a brewery just north of Walla Walla which few--including me--have heard of. It's a traditional brown ale. In that same vein, Riverport Old Man River Oatmeal Stout comes from Clarkston, Washington and will be new to most fest-goers. Three years ago, I brewed an IPA but fermented with a Belgian yeast--not a novel idea, as it turns out. Enter Stone Cali-Belgique. Finally, every year Sprecher sends the same beer, but that doesn't mean Sprecher Maibock is any less tasty. You could do worse than spending a token early in the fest on this subtle masterpiece. In addition to expanding their regular taplist by nine beers, the OBF is piloting the Buzz tent. I will confess to being slightly mystified by the intention behind this gambit, wherein 28 breweries were invited to send 1-4 "buzz beers." This would seem to subvert the idea of a "buzz beer"; by convention, such a beer is so good that it creates word-of-mouth buzz as festgoers relay what's tasty. So sequestering the beers you think will be the best in a special tent seems a bit odd. And it does look like a tasty line-up. To select just a few: Cascade Brewing Night Fall, Deschutes Bourbon Quad, Full Sail 1998 Old Boilermaker (bourbon barrel), Stone 13th Anniversary, and from Wisconsin, Sprecher Brewery Bourbon Barrel Scotch Ale. Preston Weesner, the emerging Wizard of Rare Beers (he organizes FredFest and the Winter Ale Fest), put the list together--further evidence that the beers will be good. It's sort of like a fest-within-a-fest. It has special hours and you have to buy special tickets. There doesn't appear to be a schedule, but it looks like you mostly take what they're pouring at the time. The downside seems to be that it's a bit of a crapshoot, and an expensive one. The upside is that the Fest has finally responded to beer geeks' demands that the beer quality match the OBF's reputation. Perhaps the Buzz Tent will even be a less-hectic, less frat-party-y oasis, too. Admission: $20, good for eight 4-ounce pours. With admission, tasters receive a " ticket that will give you tastes of six different buzz beers, plus two tastings of your choosing." Availability: 1000 tickets each day. "Because of the different quantities of product on hand, we can’t guarantee what beers will be pouring at any single time. Look for the chalkboard outside the tent, or follow the Buzz Tent on Twitter: @OBFBuzzTent." Here are the beers, with a special hat tip to John Foyston, who assembled them into a bullet list. The list at the official website is an unreadable block of text. 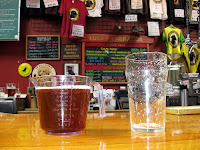 What a perfect exclamation point for this beery week: yesterday I received an email from Jenniffer Chase at the Blind Lady Ale House in San Diego. Attached was this lovely photo. Look carefully and you can see that the glasses are inscribed with a half-liter line, making them the extra-special gold standard of honest glassware. 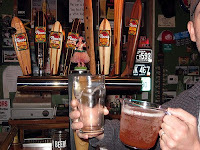 We'll have to update the website to include California--Blind Lady Ale House is now a Certified Purveyor of Honest Pints! As has now become traditional, I offer you the Oregon Brewers Guild Festival by the numbers. Compare/contrast to earlier years: 2007, 2008. Also, check out Bill's (more useful) contribution to the genre. Much, much more to come of OBF-related posting. Volunteers working at the OBF this year come 28 states, Canada, England and The Netherlands. The OBF is a force of nature; now we know it's an international force of nature. I had a wonderful time at the Portland International Beerfest, and it once again lived up to my expectations. Some folks voiced concerns that the beer list is getting repetitive and that it's turning into another over-crowded Portland beer fest. Not a bit of it. While there were lots of folks there, we had a place to sit throughout the day and never had to wait more than a few minutes for a beer. That space is cool and breezy and well-shaded. This year they borrowed the Park Avenue streets, where the beer was being poured, leaving more room for lounging under trees. Minor quibbles--no water, increasing prices--could be something the fest looks at, but they didn't badly affect the event for me. Fruit beers are something we want to love. Brewers brew lots and we try lots, but mostly we end up disappointed. Birrificio Montegioco Quarta Runa is the kind of beer we hope for. The fruit is subdued and in harmony with the beer, and the yeasties have done their job, leaving it quite dry and tart. Maybe my fave beer at the fest, and surely a world-class beer. PIB managed to get ahold of a batch of six-year-old Le Coq Imperial Stout, and they only charged three tix apiece. For this modest price, you were offered a lush, plummy stout that was just at its prime. Oxidation was minimal, but the age shone through like a fine port. It's a little hard to praise Reissdorf Kolsch in the same glowing terms because it is a modest little wallflower among rare orchids. Yet in the manner of Zen brewing--brewing a beer of perfect naturalness--I couldn't help but marvel. Word is that the Germans are dialing back the kolsch style, Budweisering it, but Reissdorf's was clean and crisp and had quite a nice bouquet of hops--and more than a little peppery zip. I don't imagine it would taste anywhere near as fresh in a bottle. Finally, Dupont Avril was a masterpiece of beer haiku. Just 3.5% to work with, and yet it was so flavorful. Cloudy and effervescent, zesty and well-hopped with earthy, spicy hops (Goldings? ), it was like a spring morning. I could live adequately on this beer alone for the rest of my life. Derek has a rich discussion of PIB at Beer Around Town if you hanker for a bit more discussion. PIB has a spotty record of good documentation about their beers. I took the online list and converted it into an Excel file, which I append here in two versions as .pdfs. The first is the beers sorted by country, the second sorted by style. Since the Honest Pint Project's launch, there have always been problems it could never solve. 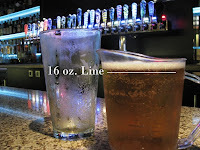 Short of mandating that pubs serve all beer in government-certified glasses that feature a prominent line demarcating a specific volume, there will always be gray areas. (And let's not kid ourselves--such a system comes with its own baggage. Someone has to pay for the government to oversee and regulate such a system, which means additional taxes. Guess where they are levied? Right, your pint of beer. So careful what you wish for.) Those gray areas were explored in depth in comments on yesterday's post. So cheers to you, Belmont Station, for exceeding even the high standards of the Honest Pint Project. Beer is local. Or was, anyway, before industrialization. Styles emerged from available ingredients, local culture, weather, water--a host of circumstances. 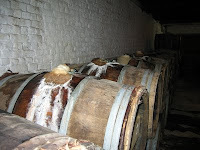 The Zenne Valley is reputed to be so hospitible to spontaneous fermentation because local fruit trees (now mostly gone) housed tasty wild yeasts. The monks of Abbaye Notre-Dame de Saint Remy brewed beer in the sixteenth century from barley and hops grown on abbey grounds. Bohemian pilsners and West Coast pale ales wouldn't be recognizeable without native hops. But then the industrial revolution made it possible for breweries to receive ingredients from thousands of miles away; its arrival meant the loss of indigenous styles and the homogenization of national brewing. But now we are following our tracks backward, and that's what makes Double Mountain's Devil's Kriek experiment especially exciting. Made with cherries grown in brewer Matt Swihart's orchards, they return us to that time of specific locality. A kriek with Rainier cherries?--must be from the American Northwest. Ah, but the experiment also shows the drawbacks of depending on specific crops. Limiting yourself to a single orchard means living and dying by the vagaries of your fruit. 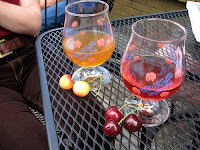 Forget consistency; like wine, each year's kriek will exhibit the qualities of the cherries. Some will be better than others, and people who admire the product will admire this variability. About seven thousand people showed up at Belmont Station on Friday to get a glass of the '09 vintage (made of '08 cherries), and I was among them. (The line was seriously insane, stretching out the door and down the sidewalk to the corner. Fortunately, we got there by 5:50 and beat the worst of the crowd.) Here's what I thought. 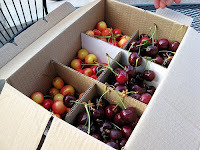 Although I got the lowdown on the beer from Matt Swihart at Belmont Station--he was there handing out cherries from his orchard--he actually blogged about the brewing process on Friday. "The base for our Krieks is a blend of three batches of a strong golden-colored beer, each fermented with a different yeast: our house ale yeast, which is of Belgian origin; our house Kölsch yeast; and the notorious wild yeast Brettanomyces. We’ve used Brettanomyces before, in the Red Devil, the IRB and in last year’s Devil’s Kriek. “Brett” contribues subtle fruitiness and barnyard character (think of smells in an old barn on a cold day) at low-level intensity and a horse blanket character (think of smells in a horse barn on a very hot day) at high intensity. Brett is also a component of many spontaneously-fermented French wines, as has legions of both fans and detractors in the winemaking world. "Devil’s Kriek was held on the cherries for 9 months, then transferred and stored cool at 34F for the remaining 3 months. The Rainier Kriek sat on cherries for the entire 12 month process at cellar temperatures ranging from 50F to 75F. The warmer ferment on the fruit allowed the Brett to assert itself more fully, driving the acidity lower and kicking out a stronger wild-yeast character. We brewed 20 barrels of Devil’s Kriek in a regular fermenter, along with 3 barrels of Rainier Kriek in a mobile mini-fermenter that was originally in service as a yeast propagation tank at Widmer." 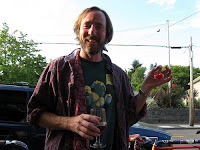 As you can see in the photo , Rainier Kriek drew very little color from the fruit; it's also a lot cloudier than the Devil's, which had a pinot-like clarity and depth of hue (though the color's all bing). Mostly the Rainier Kriek was characterized by sourness--if the cherries contributed anything, it was just at the threshold of identification. (This isn't too surprising--Rainier cherries are in no way assertive. They have a gentle cherry flavor but mostly a neutral sweetness. Cherries for people who don't like cherries.) The sour was lovely, though. I asked Matt what strain of brettanomyces he used and whether it was some kind of mild strain. (No.) Brett can get pretty funky, but not here. I found it gently sour and almost a little salty. Somehow it retained some residual sweetness, too, and the body was thicker than I expected from a brett-soured ale. A nice, quaffable beer, if such a thing can be said about a 9% sour ale. Call it a B+ on the patented rating scale. The Devil's Kriek has a candy nose with an undercurrent of chocolate and almost no sour. The flavor is surprising; as in the nose there's almost no sourness. Instead the fruit contributes the beer's two main notes, a subdued cherry and a bitter, tannic note that I assume came from the pits. As it warms, the bitter note diminishes and a bit more of the cherry comes out. Appropriately, it's fairly dry and not at all cloying--the brettanomyces have taken care of any stray sugars that might have been floating around. I suppose you can intuit the size of the beer by the mouthfeel, but the alcohol isn't especially obvious. "Not especially obvious" could be the three-word bullet for Devil's Kriek. It's a subtle, refined beer, and toward the end of the glass I was appreciating its wine-like character. But since I had the 2008 version in my head--I recall a tour-de-force of both sour and cherry intensity--I found it a bit underwhelming. Call it a B-. Based on my discussions with Ron Gansberg, fruit is hard to work with. If you're not a tinkerer, forget it. My guess is that Matt is already adapting. He said he'll leave this year's fruit on the tree for a couple weeks longer so it ripens more. This should give the beer a more intense cherry flavor and allow him to take the fruit off sooner so it doesn't extract as much from the pits. But of course, that's if the fruit cooperates. Still, I encourage everyone to track this beer down and have a glass. There aren't very many products like it in the world, and it's a rare treat to have a local brewer willing to put this much time and effort into any beer. Give it time--in a few years it could emerge as an Oregon classic. Plus, you need to fix it in your mind so that next year you have a basis for comparison. In co-sponsorship with the American Brewers Guild, the Glen Hay Falconer Foundation is offering a full-tuition scholarship to the Intensive Brewing Science & Engineering course that begins on January 18, 2010 and runs through June 25, 2010. 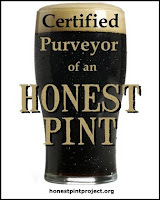 At long last, I've gotten off my keister and have actually started to officially certify pubs as Purveyors of Honest Pints. Certification Saturday was a good launch, and here are the five we managed to visit (in order of certification). Keep in mind that we already had one official certification--Hot Lips Pizza, who sent in their own certifying photo. (You can do it, too: here's how.) Here are the next five--be sure to patronize them! Under the red "certified" stamp I write the date of certification. And here's the (crude) graphic on my (crude) placards. Wealthy persons so offended by this low-budget system may contribute to the design and sticker fund. Addressing Teen Drinking: License It? Editors of the Atlantic magazine have designated the current issue "the Ideas Issue" (modestly subtitled "how to fix the world"). Here's one of their solutions, and I find it intriguing. Between 1993 and 2001, 18-to-20-year-olds showed a 56 percent jump in the rate of heavy-drinking episodes. Underage drinkers now consume more than 90 percent of their alcohol during binges. These alarming rates have life-threatening consequences: each year, underage drinking kills some 5,000 young people and contributes to roughly 600,000 injuries and 100,000 cases of sexual assault among college students. So what might states, freed from this federal penalty, do differently? They might license 18-year-olds—adults in the eyes of the law—to drink, provided they’ve completed high school, attended an alcohol-education course (that consists of more than temperance lectures and scare tactics), and kept a clean record. They might even mandate alcohol education at a young age. And they might also adopt zero-tolerance laws for drunk drivers of all ages, and require ignition interlocks on their cars. Such initiatives, modeled on driver’s education, might finally reverse the trend of consumption by young people at ever earlier ages. Binge drinking is as serious a crisis today as drunk driving was two decades ago. It’s time we tackled the problem like adults.